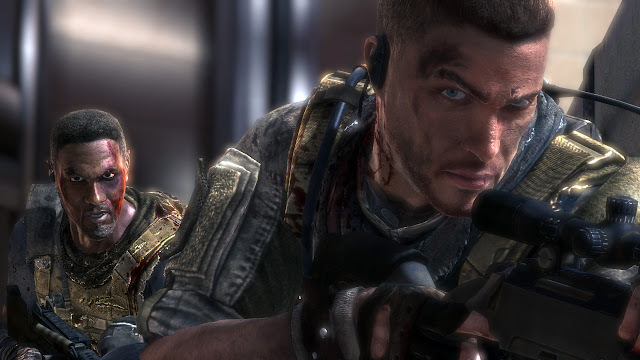 Recently I've played two of last years fantastic shooter games. One first person the other third person. Both of them push the genre far with their storytelling and really are up there with games from other genres more associated with clever plots. 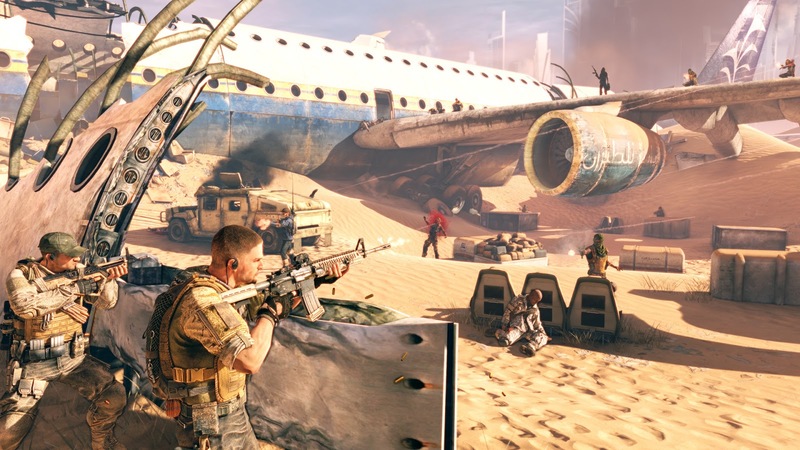 At first glance Spec Ops may seem like a typical third person military shooter, however, as you dig deeper into a Dubai covered in a sandstorm, you slowly start realizing something has gone terribly wrong. This game tells a very dark story. 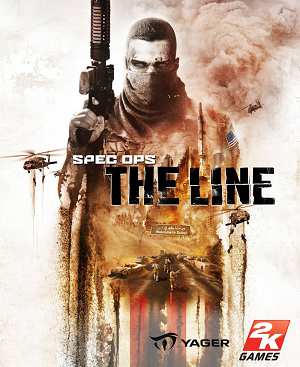 The Line is one of those few games that you actually benefit from reading the text on the back of it's cover. It draw you in and it sets itself apart form your initial expectations. Spec Ops has a terrible title and really is a game you need to dig an hour into before you get it. I don't want to really go into the plot so much in this game, because doing so will comprise the twists within it. It may not be typical for a 3rd person action shooter to have a deep storyline, but this game deviates from that norm. It has strong gameplay and balances perfectly between really good cover shooting, flanking and slowly progressing forward in firefights. Some sequences are very action orientated, others are far more tactical. It blends nicely with the cutscenes and scenarios you witness while playing. The art direction gives way for some amazing shots. 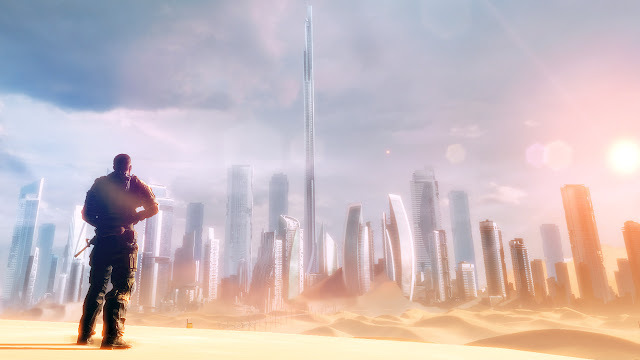 Spec Ops may at first have little grainy look to it, but the amount of variation and depiction of a city covered by sand is incredible. It contains it's playing field in a hidden city covered by a storm and gives you that almost Bioshock-like feeling of being completely cut off from the world above. There is a lot of variation in the level design and you constantly feel like it refreshes your experience by introducing new places, enemies and gameplay changes. The game has a fairly steep learning curve and does suffer from a couple of choke points which I could imagine to be really hard on higher difficulty levels. I would have maybe liked more checkpoints and a few extra hours of gameplay. However considering it's fairly short length, I recommend the game to be played consistently to help keep the story fresh in your head and to give you a more intense experience. 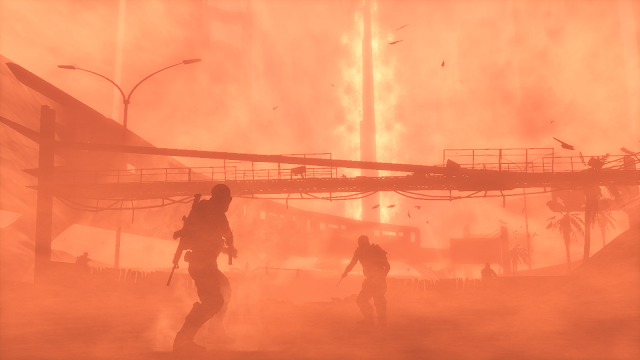 Firefights get quite intense at times and take place in really cool locations. Prepare for some gruesome scenes throughout the game. It makes you take a look at you morals in other military shooters and is one of the rare gems that makes you think more and more about it's story after you've completed it. I feel like going back to it's world and I remember some of the things I saw as terrible war scenes. 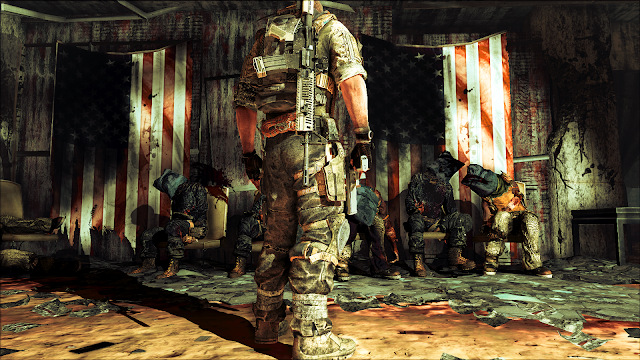 Spec Ops: The Line is one of last years best games, and it totally overwhelmed me because I had no expectations and it's truly one of the very rare games that pulls out an emotional side of yourself while playing it. Those who give this game no chance and send it off as an ordinary military shooter have missed out on an incredible experience. It often takes a third title to get a sequel back on track after trying to top an original game with so much praise. Far Cry 2 had it's fair share of ideas and in a way was a fantastic game, but it also suffered bad design choices and annoying gameplay elements. Far Cry 3 takes the best from both the original tropical shooter and the African continent survivor sequel. The result is magnificent. Jungle warfare is key in FC3, and learning it is so much fun! There are many vehicles to get around FC3's huge playing field. Right from the beginning this game draws your attention immediately. It tells the story of a group of young friends on vacation on a Pacific island resort. They end up in the wrong place and get captured by local drug lords. 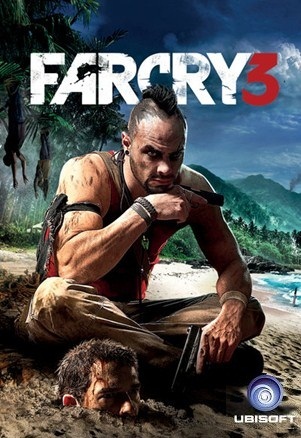 The result is that you begin the game in a cage, being introduced to one of gamings most insane characters yet; Vaas. His character is so well voiced and acted; he constantly gives me an unnerving feeling that he any time will completely flip out and do something terrible to you. He never eases you up either and really sends a chill down your spine. Escaping his prison at the beginning of the game never felt better. 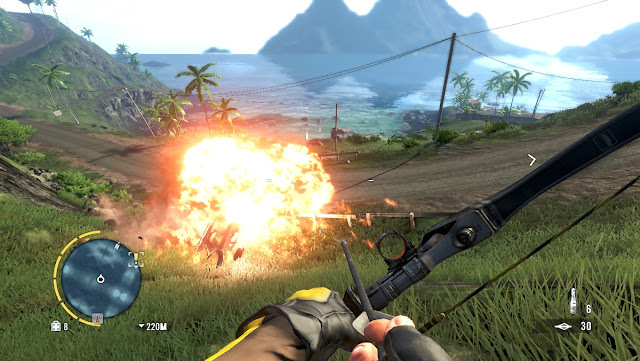 From here Far Cry 3 slowly teaches you up to become a hunter and survivor. It holds your hand for longer than what Far Cry 2 did and I think it helps. It may take away the feeling Far Cry 2 tried to give ("there is a bad guy somewhere in the game, find him"), but FC3 doesn't hide the fact that it will guide you on a main story which you must follow to complete it. You can very easily start exploring yourself, and failing to do so and continuously going for story related missions will make you kind of spoil the true Far Cry 3 experience. Luckily the game forces you at many points to go exploring. Sneaking is fairly easy and a great way to take down pirates. The game is so vast in it's size and will harshly test your gaming skills to simply survive. It's because of this it also becomes very interesting and tempting to explore on your own. You simply long to find out what's behind the next mountain top, across the water on an island or checking what a distant building holds inside. You begin with very short range weapons, and trying to hunt or cross through dense jungles with savage animals truly is difficult and gives that vital feeling of vulnerability This feeling is key to Far Cry 3, and learning to become a true hunter and not just be hunted is when the makes you feel like you have truly amazing skills. Taking over pirate bases is a great way to earn new safe zones. I was on a mountain road, when I caught sight of a wolf. Naively enough I thought I'd kill it easily with my AK47. After missing the wolf with a few rounds, a whole pack of them turned on me and nearby pirates heard the shooting. With barking and the sound of jeeps roaring up the hill behind me, I run back to my car, hit the gas and drive over two pirates on the way down. All this confusion and gunfire from the pirates makes me miss a turn. I drive off a cliff, and hit a tree further down. Destroying my car (crushed frontscreen, blurred screen and blood everywhere) and most of my health. Suddenly the whole car catches fire, including me. I get out and stop the flames on my body. Then I realize the tree and all the surrounding grass is on fire. I run like a mad man down over a beach and into the water. 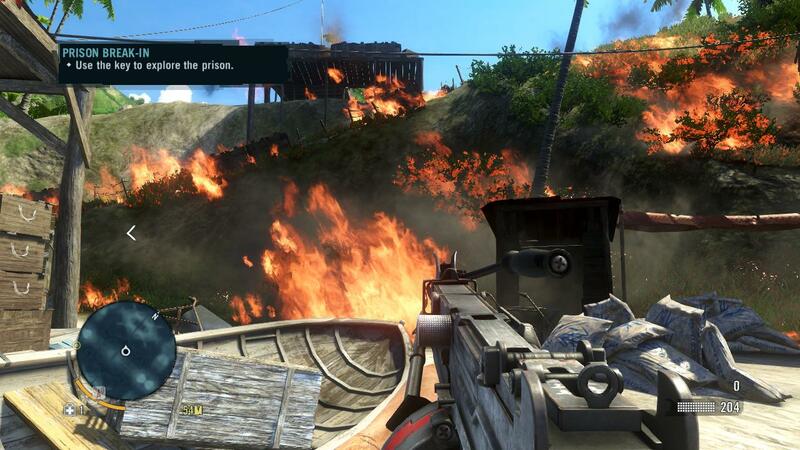 It is so random, yet such a perfect example of how fun Far Cry 3 is. I could tell a hundred small stories like this and each one is unique and what happened to me, completely separated from the story mode. The cutscenes are really good! The bow is excellent for hunting quietly! I really like the levelling in the game too. While the aiming and shooting may feel a little stiff and difficult at the beginning. Unlocking better gun skills with experience points and buying more advanced weaponry makes the game progress and the gameplay feels like it's progressing with your skills. There are a couple of issues, escpecially regarding the animation. It lends some of the stiffness and a bit rough animation that Far Cry 2 had. It gives a fairly big gap between the perfactly animated cutscenes and the game itself. The driving mechanics too, feel a little basic, but I guess it does it's job. Far Cry 3 finally returns to it's tropical roots. The combination of incredible cutscenes, colourful characters and really varied story missions, with tons of side missions, exploring, hunting and taking over territories, this game simply ends up being this years best game released.